The Sales Performance report provides you with a leaderboard view of your sales team's performance. This information is displayed in top-level metrics and visual bar graphs. Using this report will give you a quick glance of the current health of your sales team and provide historical information. View sales performance metrics, including total deal value, total number of deals, and average deal value. 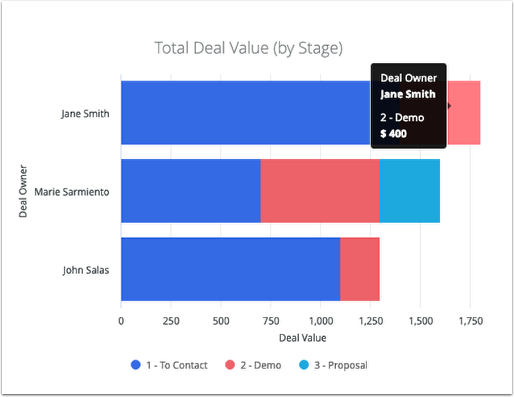 You'll also be able to view the visual bar graphs depicting the deal value by stage and number of deals for each sales representative on your team and view a table of each deal in the selected pipeline with deal owner and deal value. View information by Deal Status (Open, Won, or Lost), Currency, or Pipeline. Export each statistic, graph, and table individually into a CSV, TXT, Excel (2007 or later), JSON, HTML, or Markdown file. This report is can only be accessed by users assigned to the Admin group or who have permission to view reports. Click here to learn more about user permissions. Click "Reports" located in the leftside menu. Then click the "Sales Performance" option. 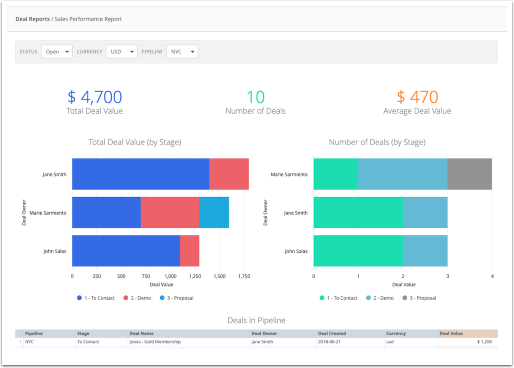 The Sales Performance report will load and display top level metrics of your team's performance. Deal value displays the total value for deals. Total number of deals that make up that total value. Average value for each deal. The Total Deal Value (by Stage) graph lists each deal owner in the selected pipeline and their total deal value by stage. You can hover your mouse over the bars included in the graph to see a breakdown of the number of deals in a particular stage, stage name, and the value for all deals in that stage. The Number of Deals (by Stage) graph lists each deal owner in the selected pipeline and the number of deals they have in each stage. 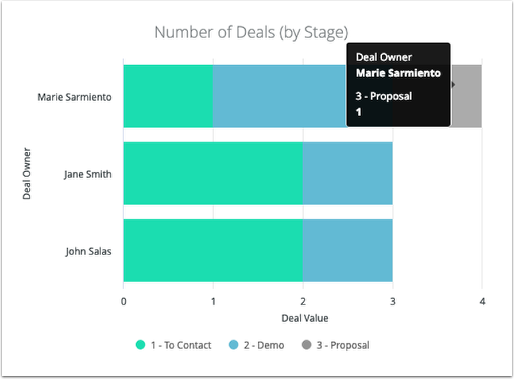 You can hover your mouse over the bars included in the graph to see a breakdown of the deal owner, stage name, and number of deals in that particular stage. The Deals in Pipeline table lists all deals in the selected pipeline along with deal owner, stage, date the deal was created, currency, and deal value. Clicking the column headers in the table will let you sort data in ascending or descending order. At the top right of each statistic, graph, and table on the report is an icon containing three dots. When you click this icon, a "Download Data" option will appear. Click this option to download a CSV file of the graph data. Note that there isn't an option to download all data on the report at once.